If you want to protect your document, do the following. -Click on the Office Button > Save As. -Save As Dialogue box will appear. -Click on Tools option>General Option. -There are many options available. Among them, you click on the General Option. -In the Password to open box, type your secret password. -On the Password to modify box type again the same password. -On the Office button>word option. -Select the fonts from the categories list box. -Choose anyone font which you want. -In addition, click assign button. -Close the customize dialogue box. -After you can change the font from the keyboard hotkey. -Press Ctrl+ [ sign for decrease and Ctrl+] sign for increase. To change Font, Font Style and Size. Press Ctrl+D (After Press Ctrl+d you will get the font dialogue box . And you can change the font . -Select the text, which you want to make superscript. -Select the text, which you want to make subscript. -Symbol dialogue box will appear. -Choose any one symbol, which you like, and insert button. To print the all active file or selected item. Print dialogue box will appear . First of all ,select the printer name by clicking on the dropdown arrow. If you select the page range, type the number of the page on the text box. Click on graphic tab and select the print graphic which you want. During the various stages of creation, you might need to look at your document using different views, each suited working in a different way. Tips : Click on view menu and select the view you want. (Print Layout, full Screen Reading, Web Layout, Outline , Draft) The Print Layout view suited to create and edit the document. 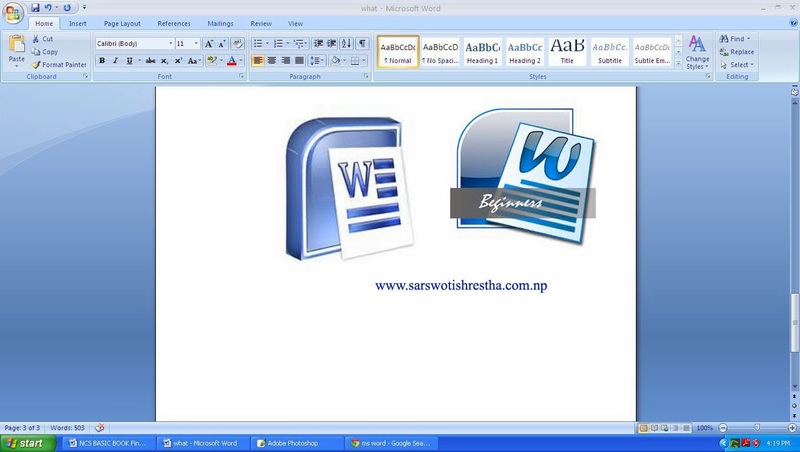 The Word of Computer is made in English format only if we want to type in Nepali format it occurs many problems in word. At that time we will have to remove the ticks from the Auto Correct Option. The Tips are given below. -Click on the Microsoft Office Button and then click word options at the bottom of the window. -Click on the Proofing link at the left pane of the window. -Click on the Autocorrect Option button. After that you will get the Autocorrect Option dialogue box. -Remove the tick mark of Capitalize first letter of sentence and Replace text as you type. -Click on the Auto Format as you type. -Then remove the tick mark from Straight quotes with small quotes and Hyphens (-) with (-) option. -Then click on the Ok button. -Click on the File tab, and then under word click option. -Click on the Proofing link located at the left pane of Word option window. -On the Autocorrect tab, select or clear any of the check boxes. Then a dialog box will appear.